A blend of wholegrains, freeze dried berries, dried dates, pumpkin seeds, and a dusting of beetroot powder. Wholegrains. Making breakfast better. High in fibre. No added sugar. No small talk before breakfast. Three types of berries and a dusting of beetroot powder. Super in so many ways. They even turn the milk pink. Yes please. Making Breakfast Better We've always had a soft spot for breakfast. But we've always thought we could make breakfast better: tastier, healthier, simpler and frankly more exciting. Every day is different and we think breakfast should be too. So we decided to do something about it, and that something is Spoon. We make breakfast worth getting out of bed for. 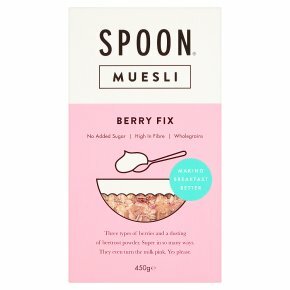 We want the world to wake up ready to take on the day knowing Spoon is there to get them going. And we believe the answer to all this lies in a breakfast bowl: endless combinations of tasty, good things that get taste-buds fired up for whatever lies ahead. Tastier We obsess over flavour combos - quite simply it's why we get up in the mornings. It's also why we began the UK's first cereal pop-up and it's why we'll keep creating more delicious recipes using only simple high-quality ingredients. Because at the end (or beginning) of the day, breakfast should be super tasty. Healthier Never refined sugar, no artificial preservatives, colours or flavours, and always lots of wholegrains we make breakfast that's high in fibre for a healthy gut. Because we all want to status the day on a health high. Simpler Our ingredient lists are clean and lean. They may even inspire the passionate cooks among us to have a go at home. Make it don't fake it, we say.